[Cross-posted from the Google Lat Long Blog] Today we’re premiering our new Real-World Sightings series on Google Earth and Google Maps. As part of this experiment, we’ve added 10 images to the map based on stories we’ve heard from our users. As is common with betas, we’ll evaluate interest and engagement with this feature before determining future rollout plans. It all started with a recent visit to my friend Nessie in Boston. As I crossed the bridge into town, the car in front of me stopped short so I slammed on the brakes. The cars next to me were also stopped, so I got out to see what was causing the back up. 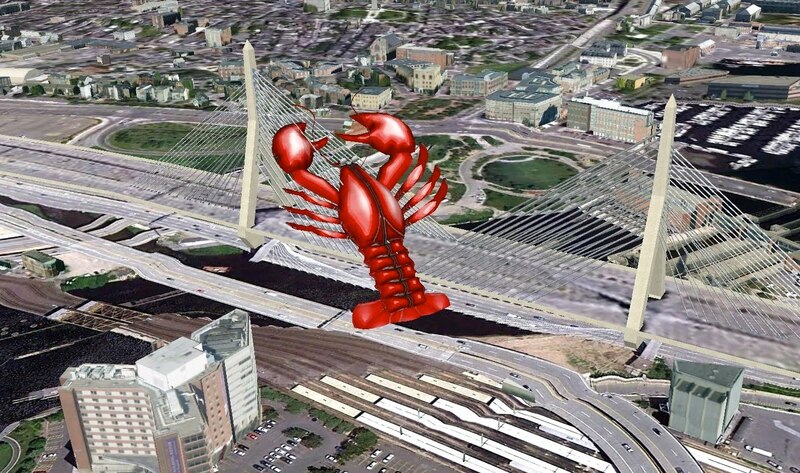 There was a huge, red lobster sitting on the bridge. I love this story! and all the creatures! A fabulous way to honor such a fun day...Thanks! Makes me want to put reaverbot on Google Erath too ^q^. As a young person I have many delightful things and like share stories of the strange. google map and earth have good convenient for people to know the world.